I know everyone is talking about Marie Kondo... again. When her book came out in 2012 there was a lot of buzz about her tidying up methods, especially in the blogging world. As with anything that comes out there was lots of love and lots of hate it seems for the methods. 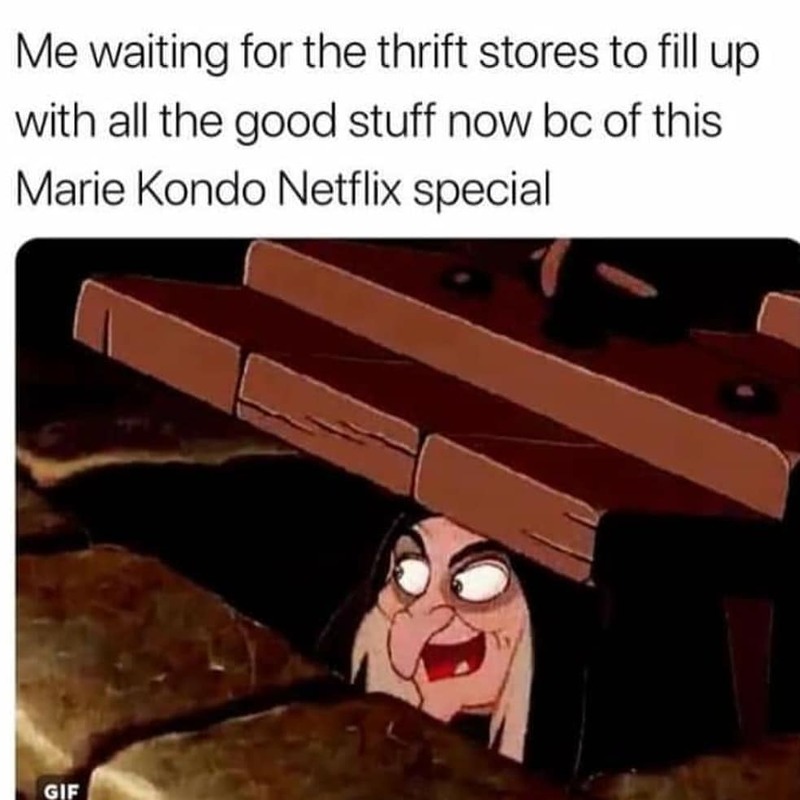 It seemed to have died down until recently when Netflix released Tidying up with Marie Kondo. 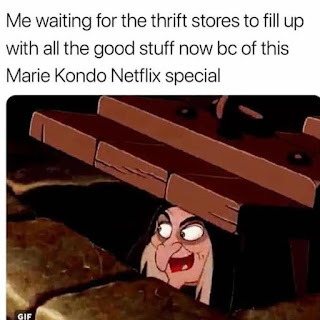 This made me laugh.. 1. because I am a huge thrifter and 2. it's so true! People will be going through stuff and getting rid of things after watching the series and I want to be ready. #sorrynotsorry. After the initial laugh, I realized I also need to go through my house and declutter and organize. We are planning to buy a house this year and I really don't want to move all the things that don't bring me joy. I also realized I am a box person.. meaning I basically create clutter by putting things in boxes rather than either finding a home for it or just getting rid of it. As we speak there are 3 small boxes lined up along the wall next to my bed with "stuff" in them. The stuff is defined by random things that I don't know what else to do with. (I will post a photo of these boxes. Stay tuned! Just by writing this post, I have realized how much I really need to go through all of this stuff and get rid of it. I also have a problem with clothes. Most of my clothes don't fit since having the baby. Do I just get rid of everything pre-baby? Do I hold on until I lose the baby weight? Like seriously none of it brings me joy right now because of obvious reasons, but dude it's like 90% of my wardrobe. That just sounds expensive. I am going to have to think about that one. I will however probably try the folding methods due to having no space in my drawers. I am hoping this will at least create more space and I will be able to find what I am looking for. We BADLY need to work on our paper clutter. We have stuff everywhere. It is time to sort and shred. This actually brings me anxiety. There is SO much and it is mostly because R doesn't like to get rid of any record of anything, Some things I understand keeping, but a brochure from your bank from 20 years ago probably doesn't need to be kept? Anywho, I think I am going to try this out. I am going to at lease sort and fold my clothes and get rid of the boxes of "stuff". That is something I have put off WAY to long! I also want to remind myself to thank my house more. It is a good house. It deserves some love! I will check back soon with my progress! Have you tried the KonMari methods?